The concept of European Food Halls is back! With all the new trends of being a vegan, a pescetarian and other practices, restaurants have been smart to group with each other and create exciting shared spaces for the community. Other food halls like the one from Harrods in London, and the Tivoli Food Hall in Stockholm are gorgeous, but Hlemmur and Grandi Mathöll in Reykjavik have nothing to envy them. Going out for lunch or dinner in Reykjavik can be a little bit expensive, but it is worth it once in a while. Really worth it. Fresh fish, gourmet styles and organic ingredients are some of the things you will find in Iceland. The concept of Food Halls has re-born all around Europe in the past few years, and people like this. If you have never been to one, imagine yourself in a gourmet market with different types of food and styles, and you can sit all around the place and order from every single one of the restaurants. Bread & Co is an artisan bakery very well-known in the city. They are famous for their delicious sourdough bread, and of course, the buttery danish. Who would forget to try this in Reykjavik, if they are everywhere! But Braud & Co has a fantastic one. Icelandic love Danish food, and who wouldn’t? This small booth offers all kinds of Danish sandwiches. We haven’t tried them, but they look good, for sure! Ok, you got us. We are obsessed with this food and thank God Hlemmur has one. There is nothing a good taco can’t cure. They have fish, chicken, and even vegan taco! 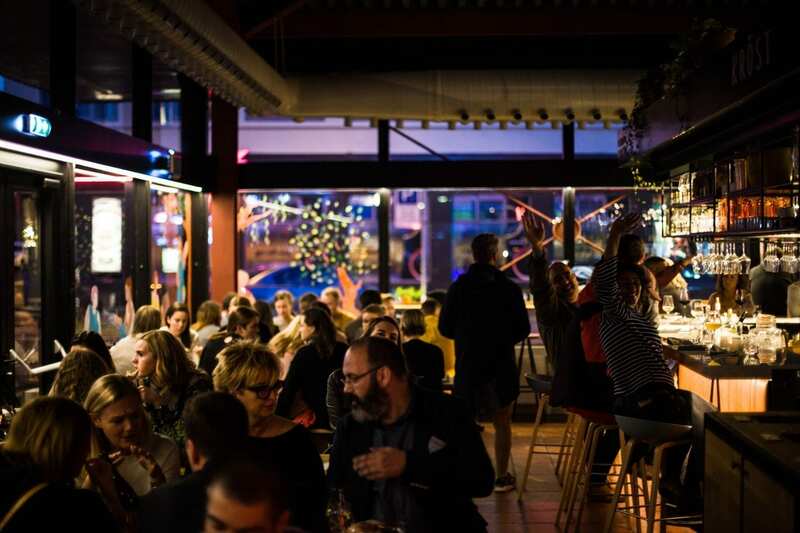 An Icelandic concept of bar & restaurant with delicious food! The grilled sourdough bread, the gratinated goat cheese with syrup and of course, the hot dogs, are the best! Ask if they have the seasonal Borg Beer. We had the Christmas one, and it was terrific. Tea or coffee, ladies? Enjoy one of them with a dessert for the sweet tooth or a mid-day snack. The nice thing about them is that they have their roaster at Aðalstræti, and that’s why the coffee is so good and fresh! Gourmet and chic: this is what Kröst is. A grill and wine bar in Hlemmur that offers good wine, cured meats and cheeses, burgers and more. They also have options for vegans and vegetarians. You can’t miss this one! An option for Vietnamese street food that you will love! The smell of the different spices, fresh vegetables and meat, and our favorite, the sriracha sauce, make all of the options perfect to eat! As you can see, they are so many options that everyone can eat here. And if you are interested in being a responsible consumer, well, you have nothing to be concerned. Iceland is still a country that protects the local productions and collaborations, and Hlemmur is all about that with the locals. Hlemmur Mathöll opens at 8:00 until 23:00, but every stall manages their opening hours. Grandi Mathöll: a food-lovers paradise. Their specialty is the Icelandic lamb, and it is delicious! They have other fresh meats and unique flavors in their vegetables, but most important is that they explain to their customers why they care so much about Iceland and leaving a minimal carbon footprint with their productions. Try the lamb burger. It is out of this world! This one is very cool! Their concept of Korean street food is different and unique: fast food and slow drinks. It has an American touch too. The Korean tacos are really good, but our favorite is the Kimchi Burger. We had the Jólabjor (Christmas Beer) with our food, and it was funky fresh! All we can say about the Gastro Truck is: spicy chicken burger! It is fantastic, and for sure it is their signature dish. The flavor and juiciness of the chicken is perfect. A must-try! If you are in Grandi Mathöll and you are looking for other activities, check this blog post on the Old Harbour. We hope you can go and try all the places we recommended. Leave us a comment and let us know which one was your favorite. Verði þér að góðu!